Have you ever used the phrase, "too good to be true?" It's common enough, so the chances are high. Maybe you married the man or woman of your dreams, landed your dream job, or have the best kids in the world. Too good to be true. 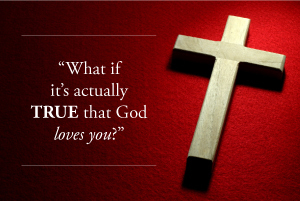 What if it's actually true that God loves you? First we have God, the one who eternally is, who cannot be seen or controlled or predicted, who created everything that exists and is always everywhere sustaining the entire universe. He is wiser than wisdom, stronger than strength, bigger than huge. No one is more ancient or current or dependable or powerful than Him. And then we have you - in all your glory and smallness, all your ambition and sin. You might be great, but in the grand scheme of everything you're just a speck. And in the middle - love. Ridiculous, if you think about it. Can it be true? Every day when I come home from work, my daughter shrieks "Hi, Daddy!" and hugs me. Then we play a game. She runs away, looks back and says, "I chase you! I chase you!" Of course she's not really chasing me, because she's running the other direction. She is testing whether or not I will chase her. She wants to know that I want to be with her. She's looking for proof that no matter how tired or stressed or busy I am, I will still take the time to chase her down, pick her up, kiss her chubby cheeks, put her back on her feet and then do it all over again. I love my child like crazy. God loves you even more. Too good to be true? I guess not. Michael DeFazio is the Director of Ministry at Real Life Church and has written two books, Jesus in 3D and More Jesus. To learn about Real Life Church, go to www.reallifechurch.org, follow them on Facebook at Real Life Church or join them for their Arts Undergrounds concert on May 31. Real Life Church's dream of creating a neighborhood gathering place and a home base for people in this valley has been realized. 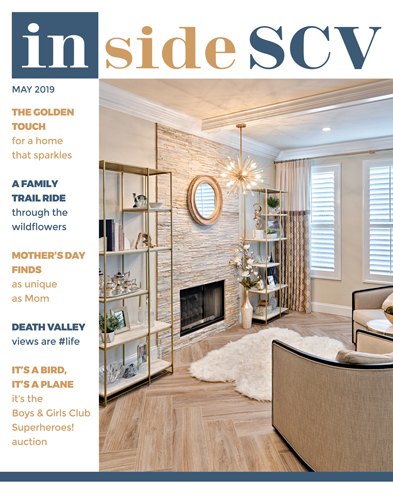 Savia: A Community Partnership is a 23,000-square-foot center that houses three non-profits - A Light of Hope, Single Mothers Outreach and the Domestic Violence Center - as well as the architect/builder of the project, Focus Buildings. It opened Sunday, May 5 at 23780 Newhall Avenue with the offering of two English-speaking services at 8:30 am and 10 am and a Spanish-speaking service, Vida Real, at 12 pm in the 285-seat auditorium. Opening May 20 is Artisan Java and Juice, a non-profit organic coffee, tea and juice bar. Says General Manager Lori Knight: "We give 100 percent of our profit away to a local charity that is doing good in our community. We will be a place where people can find an organic experience, everything from the inviting ambiance of the space to the beverage you enjoy. Check out our website artisanjavajuice.com for the menu and updates." 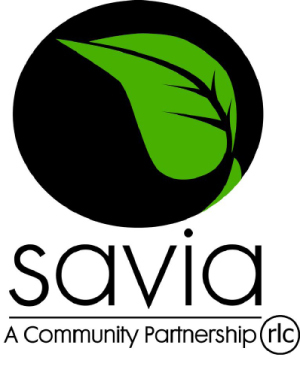 Savia will also have a Wi-Fi work lounge, classrooms and conference rooms - all available for community use throughout the week. "Real Life Church is thrilled to open a Community Partnership in the heart of Newhall," says Lead Pastor Rusty George. "We look forward to offering a recovery program as well as both English- and Spanish-speaking services through this venue. We think this partnership with the people of Newhall, the City of Santa Clarita, the non-profits and Real Life Church will shine a bright light in our valley."